I guess we are now closer to Christmas than many of us would like. It seemed like yesterday it was New Years Day and now look! 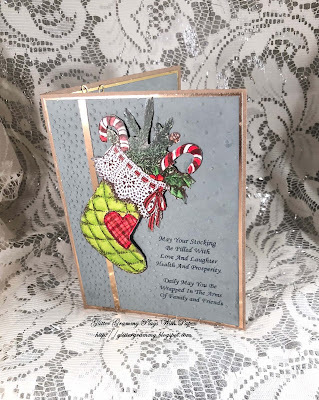 This month the Sparkles Christmas Challenge theme was picked by Jacky. She picked Christmas Stockings. I dug deep into my Christmas stamps and found this cute stamp. It is a PSX stamp from 1995. # K-1520. It just dawned on me that this stamp is older than some of those reading my blog.... I must say, I've always loved this stamp and it's time to let it once again touch some ink. 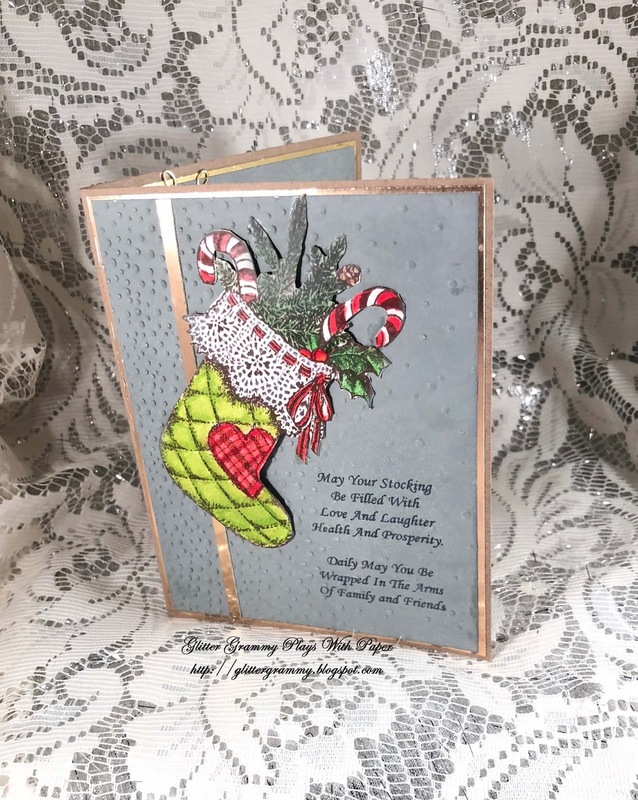 After stamping and coloring the stamp, I fussy cut it and used dimensional squares to adhere it to a piece of white card which was colored with my Tim Holtz Distress Oxide - iced spruce ink. 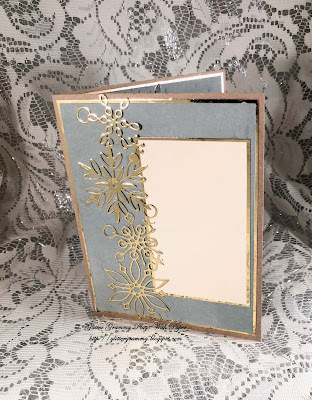 I then embossed the card using my 6x6 Sizzix embossing folder. I think it is named Falling Snow. It's one I purchased from Stamping Up. I composed the sentiment on my computer and ran the colored card through my printer prior to embossing it. 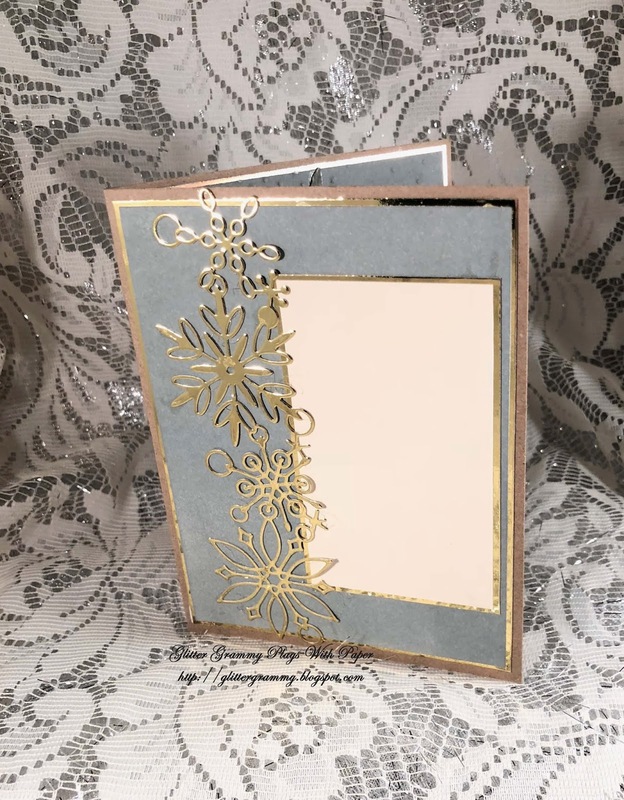 I mounted it onto gold mirror card and then onto craft card. The inside uses many of the same items. I did however add a die from Poppystamps - Frozen Flakes #1033. I really like this die, it makes a great border and is large enough to make quite a snowy statement. I hope you have a chance to play along with this month's Sparkles Christmas Challenge. I look forward to seeing what you've created. There are lots of ideas so check them out here.